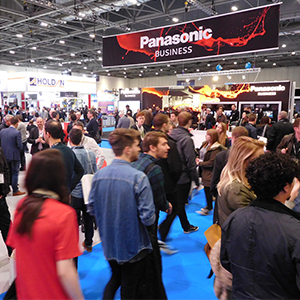 Azule's Peter Savage managed to drag himself away from his countless BVE meetings (and the show bar) for long enough to discover that ˜easy-to-use' was the tipple of choice at this year's show. Trade shows are funny things. When you arrange a lot of meetings, it is quite easy to spend an entire week at an exhibition and not see any kit or attend any seminars. Generally this is fine as you benefit from talking to a lot of people in a short space of time. But that doesn't necessarily broaden your mind. So at BVE this year I made a concerted effort to see some of the things on show. Now, you may be thinking €˜see some of the things on show' is just a euphemism for 'wandering the hall and then heading to the bar'. But you'd be wrong. I did visit the bar, granted, but I saw some pretty interesting stuff too: and 'easy-to-use' was very much the order of the day. These are my five highlights. There were lots of interesting cameras on show from the Panasonic LT (a cut-down version of the Pansonic 35 for documentary filmmakers) to a 4k broadcast camera from CIS (the VCC-4K1) that was so new it's not even listed on the company's website. The stand out shooter for me, however, was from Sony. The PXW-Z150 is an XDCam camcorder that is lightweight and simple to use, as you might expect, but also includes wireless functions and 4k (3840x2160) up to 30P. It also does fives times slo-mo in HD at up to 120 frames per second. With live streaming capabilities and FTP wireless connection with built-in Wi-Fi, it looks ideal for corporate production or fast turnaround factual. I'm no expect but even I could work the very impressive TechnoDolly, a programmable, repeatable telescoping camera crane, based on the Techno 15, that was on show via Technocrane. To programme it you simply sample the first and last frames, and then a couple of frames in between. Once you have adjusted the focus and zoom you press the play button. And, um, that's it. A computer not only fills in the gaps for you it stores all your moves and can repeat them ad infinitum. I couldn't believe how simple it was. And simple is good in my book. An improvement in LED technology has completely changed the way the TV industry lights a shot. Fluorescents are still used but tungsten is rarely seen these days as the advantages of LED far outweigh any lingering cost issues. At BVE I saw a couple of very interesting innovations. Sumolight's Sumospace is a hexagon-shaped bi-colour fixture with a 6k output and the reduced power consumption of an LED that renders really strong, vibrant colour. Designed for studios, it is light and collapsible and folds away into a tiny bag. This is not your standard studio light I can assure you. At the same time the Mole-Richardson Company has its 900W SeniorLED Fresnel and the 100W Vari-MoleLED. The former has a 5K equivalent output in a single source LED while the variable colour Vari-Mole is a full colour spectrum LED in a portable, all-in-one kit-style fixture. Again, it is designed for ease-of-use. On the WTS Broadcast stand, the Californian firm TVU Networks was showing its TVU One, a live, mobile IP newsgathering HD video transmitter. It's a bit like the full-size TVUPack backpack transmitter but is much smaller and lighter. I didn't test it but, according to the TVU guys, it uses the same proprietary Inverse StatMux Plus technology as the TVUPack. This means you can rely it on it not to fall over, which is rather crucial. Finally, here's something that is going to sound a bit Star Trek. The UK start-up Kino Mo was showing 3D holographic displays at BVE that you can generate by simply transferring images or video from a computer via USB or wirelessly. I would imagine that they would be used for in-store advertising and such like but there could be other applications too. They caused a proper kerfuffle at the show, that's for sure. It's not often you see Harry Potter actress Emma Watson floating in mid-air right in front of you. And before you accuse me of visiting that stand AFTER I'd been to the bar, I can assure you that I hadn't touched a drop before I saw those holograms. It was all real. It's a good thing I did branch out this year and look at the stands. It would have been a real shame to miss any of this stuff. Now, where did I put that drink?